(4) Figures to the right indicate full marks. 1(A) A Mention important specification of ADC and DAC required for communication. (5 marks) 1(B) A difference amplifier is to be designed to amplify the difference between two voltages by a factor of 20. The inputs each approximately equal to 2V. 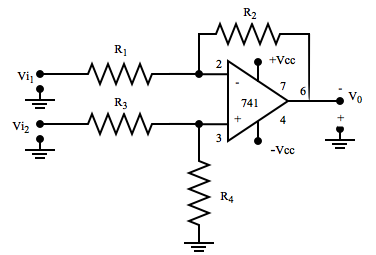 Determine suitable resistor values for the circuit shown in fig.1 using a 741 opamp. (5 marks) 1(C) With neat blok diagram explain how PLL can be used to generate large number of frequencies from a single reference frequency. (5 marks) 1(D) When a broadcast AM transmitter is 50% modulated, its antenna current is 12A. What will be current, when the modulation depth is increased to 0.9? (5 marks) 2(A) For the common source circuit shown in fig.2. Calculate the gate input impedance, the drain output impedance, the circuit input and output impedance and the voltage gain. Use the typical parameters for the FET.